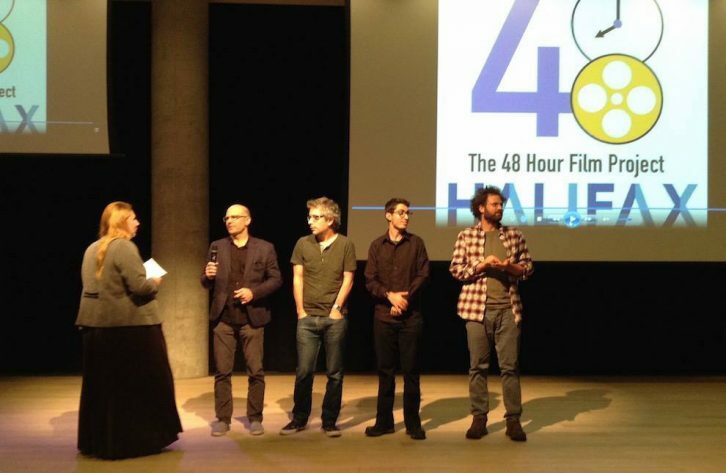 Chowder, a musical created by a team known as Gravy Train, was the first winner of the Halifax 48 Hour Film Project, an honour presented on the weekend at Halifax’s Paul O’Regan Hall. The project, which takes place in 130 cities worldwide, offers filmmakers, amateurs and anyone interested the opportunity to promote their work on an international stage. But only in 48 hours. Seven Halifax teams entered the whirlwind project but only four completed their films in the two-day timespan. Chowder follows a girl, Petra, as she makes seafood chowder. On her journey she befriends the lobster, one of her main ingredients, but in the end there is a falling out, and the soup is made. The Halifax producer for the project, Blerina Berberi, says she feels a sense of isolation in the city for filmmakers and that this is a reason why she wanted to bring the project to Halifax. “I like projects that are international and cross borders, so talents in the creative field are promoted internationally,” she says. Chowder now moves on to Filmapalooza, the finale for the 48 Hour Project, where winners from each city come together to compete against each other. Filmapalooza will be held in Seattle in March 2017. This year’s sole prize was the chance to compete in Filmapalooza but Berberi plans to have more prizes and awards for contestants next year. The Halifax films are available to view online.